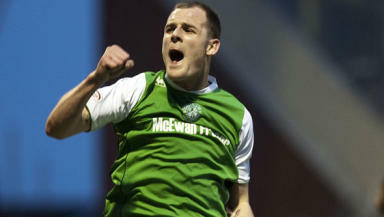 Celtic linked with move for Hibs hotshot Anthony Stokes- report. New Celtic boss Neil Lennon could be set to look closer to home as he goes about rebuilding his squad for nest season’s title challenge. The Hoops gaffer has been linked with a number of signings down South as well as abroad as he gets set to embark on his first season in charge at Parkhead. But now it appears the answer to Lennon’s hopes of bolstering his shot shy strike force could lie just 50 miles up the M8 in former Celtic target Anthony Stokes. According to a report in the Daily Express Celtic have switched attention to the 21-year old Hibs hotshot after Scunthorpe target Gary Hooper looks likely to move to Gordon Strachan’s Middlesbrough. Sunderland frontman Daryl Murphy is also on Lennon's list of targets but Stokes' package, including his wages and £1 million transfer would be far cheaper. The Hibs striker also fits rookie Hoops boss declaration that he intended to follow former Celtic manager Martin O’Neill’s blueprint for success of buy British and Ireland players who could hit the ground running in the SPL. Stokes who is currently playing some of the best football of his career for Hibs certainly comes into that category having scored 21 goals last season for John Hughes Easter Road side. Celtic tried to sign Stokes from Arsenal after his successful loan spell three years ago but after holding talks he walked out and joined Premiership side Sunderland. Last month Stokes admitted he regreted picking Sunderland ahead of Celtic when Gordon Strachan tried to sign him for the Glasgow club. The Parkhead club recently failed in their attempt to sign Ittihad Egyptian ace Mohamed ‘Gedo’ Nagy ona reported £600,000 season loan long deal, after he chose to stay in his homeland in a £1m deal with Egyptian champs Al-Ahly. Now it would appear the answer to the riddle of how to wrestle the SPL title away from Walter Smith’s Rangers may not lie in Scunthorpe or the land of the Sphinx after all - but closer to home in Leith. Other targets on Lennon’s radar include £5m rated Cardiff City midfield star Joe Ledley, Stoke’s Liam Lawrence, out of contract Dons defender Charlie Mulgrew as well as Arsenal and former England international stopper Sol Campbell who is still weighing up a two-year deal to come north to Parkhead.